Indicating Silica Gel Packets have indicating beads that turn from Orange to Green when 60% absorbed. Dimensions: 1 3/8" x 2 5/8"
Our Indicating Silica Gel Packets do NOT contain Cobalt Chloride (II) (Indicating Silica Gel that is usually blue in color which has been linked as being possibly carcinogenic to humans and been labeled as hazardous material in some countries). Our Indicating Silica Gel is reformulated to remove Cobalt Chloride (II) which provides our customers with a safe Indicating Silica Gel Packet to use. 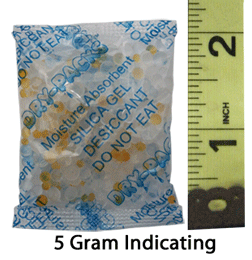 Our Indicating beads will turn from Yellow to Dark Green when the Silica Gel is about 60% absorbed with moisture. When used in closed places (where mold and fungus live and breed) silica gel whisks away moisture to create a protective environment of dry air. It prevents all forms of rust, corrosion, oxidation, mildew, fungus, mold, etc. Prevents tarnish on gold and silver. Put in your toolboxes to protect your precious tools from rusting. Drop some in your camera bag to protect your valuable camera equipment. It even protects expensive leather items like jackets, shoes, and boots. 1 3/8" x 2 5/8"
Shoes, Cameras, Underwater Housings, Security Camera Housings, Tool Boxes, Electronics, Cell Phones, iPod, Razor Blades, Hearing Aids, Travel Bags, Purses, Industrial Equipment, Shipping Cartons, Etc.